With a relaxed fit and eye-catching textural lace at the yoke, Pine Creek will quickly become the sweater that you reach for over and over. You can style it for an afternoon of hygge with leggings and cozy socks. Or you can glam it up by layering over a tunic dress with your coolest boots. With seven sizes included in the pattern, you can choose to knit your sweater with as much or as little positive ease as you like. 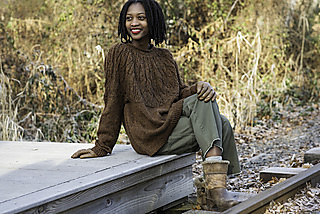 The model in the photos is wearing the 49” size sweater with 13” of positive ease for a very relaxed fit, perfect for layering. 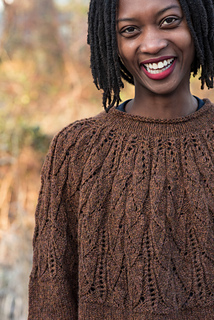 Pine Creek is knit seamlessly from the top down. The yoke is cast on with provisional stitches and short rows are worked to raise the back neck. The yoke lace is knit, then the body and sleeves are separated and each worked top down. The only finishing is to pick up the provisional stitches at the neck and work a rolled neckline. Lace instructions are both charted and written. You could easily substitute the rolled hem neckline with your favorite neckline, OR you could opt for a wider neck opening by omitting the neck rows. To do this, pick up this provisional sts, knit one row and then bind off with a tidy i-cord bind off. 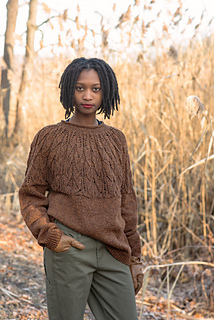 Knit a shorter body for a cropped version that would look fabulous styled with high waisted trousers or layered over your favorite winter dresses. The Fibre Co’s new DK weight, woolen spun yarn, Lore is a perfect match for the bold lace yoke and classic stockinette body of Pine Creek. The lofty, but surprisingly strong hand of this yarn creates a a beautiful fabric that I truly can’t get enough of. Lore is spun from Romney Lambswool and is processed in a mill in England’s historical textile region of West Yorkshire. This is a yarn that will make durable, lasting garments without sacrificing any of the comfort that you crave. I would love to see how you make Pine Creek your own. Please share your yarn choices, works in progress and beautiful finished sweaters with #pinecreeksweater and #samanthaguerindesign Happy knitting, friends! Intended to be worn with 4-8” positive ease. Select a size 4-8” larger than your bust circumference; measurements below are for the finished garment.